If you’re obsessing over something negative that happened – go find a park and take a walk. According to Stanford University researchers, spending time in nature actually decreases blood flow to the part of the brain that we use to dwell on things. Which can make you calmer in just minutes. If your partner – or best friend – is sick, don’t let them borrow your phone. Or if you do, clean it first before you use it again. Gadgets with glass touch screens carry 18 times more bacteria than a toilet’s flush handle! And a recent Stanford University study found that if you put a virus on a glass surface, at least 30% of that virus will end up on your fingertips! Don’t lend out your cellphone! It’s the start of the flu season… And if someone is sick, don’t let them borrow your phone. Or if you do, clean it before you use it again. Gadgets with glass touch-screens carry 18 times more bacteria than a toilet’s flush handle! And a recent Stanford University study found that if you put a virus on a glass surface, at least 30% of that virus will end up on your fingertips! wiggle your toes or drum your fingers for a minute. Stanford University scientists say the fine motor control involved in drumming or wiggling fingers and toes tells the brain to dial down the production of stress hormones. And those movements not only reduce anxiety by stimulating our nerves, they also increase activity among our disease-fighting white blood cells. I’ve got a couple of quick tricks to help age-proof your brain. •First: Go shopping! Several studies show that shopping gets your mind and body moving – both of which benefit the brain. •The second way to age-proof your brain: Watch something funny. According to research at Stanford University, hearing a joke engages most of the major regions of your brain. And the more you use your gray matter, the healthier it stays over time. Want that ‘Get Up & Go’ feeling? Stretch! According to research from Stanford University, just one minute of stretching can stimulate your brain’s alertness center, and increase your energy and brainpower by 45% for an hour! So take a minute to stretch before you head out the door. Get yourself a pedometer and walk more. I’m sure you’ve heard what the American Heart Association says. They say we should take at least 10-thousand steps per day, which is about three miles. But the majority of us take barely 3,000 steps a day! The moral of the story – put on your sneakers and start walking! And try a pedometer. 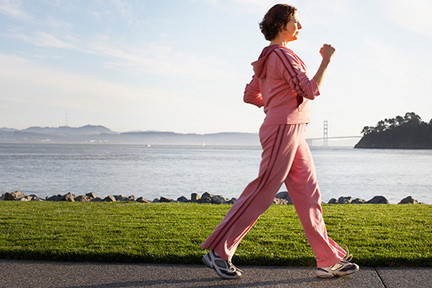 According to Stanford University, wearing a pedometer will motivate you to take 2,000 extra steps each day. That’s enough to lower your blood pressure and burn about a pound of fat a week.